(Newser) – Sheet music written by Ludwig van Beethoven and found in a Connecticut home has fetched $100,000 at auction. Appraiser Brendan Ryan spotted the sheet music when he visited the home of a Greenwich woman looking to sell some belongings. 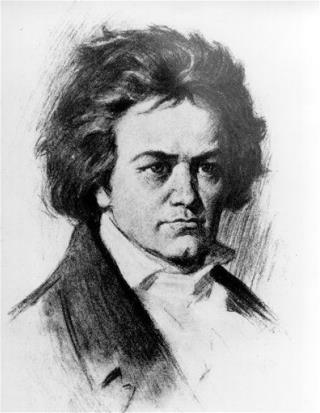 He recognized Beethoven's handwriting in the German words, directions, and symbols on the page, he tells the Greenwich Time. "I knew what it was. I’d seen his handwriting before." Ryan turned to an old mentor to authenticate the music; he determined it was from a sketchbook dating to 1810 and used by the composer for brainstorming. "Beethoven would write out his ideas. With most composers, we just have the final product—they threw the rest out. Beethoven didn’t throw anything out," says the mentor. "I found the sketchbook, and referenced the exact piece, we put it all together." Even if Beethoven was alive today, he wouldn't hear a word of the sale. I would think it would have fetched more than $100K. I guess they are not that rare.